What Type of Solar Insolation Data do I Need? If you start looking for solar radiation (insolation/irradiance) data, you will find several varieties of such data. For example, solar insolation data can be for extraterrestrial or terrestrial solar radiation. Also data is available for direct, diffuse, and total insolation and it is available as daily, monthly or annual average values. See the article, ‘Estimating Solar Radiation Rate to the tilted surface of a Solar Panel in the U.S.‘ for a discussion of extraterrestrial and terrestrial and direct, diffuse, and total solar insolation. For passive solar heating applications, monthly average solar insolation values are typically adequate, and both diffuse and direct solar radiation can be used, so total monthly average solar insolation values at the site of interest are the type of data needed. The National Renewable Energy Laboratory (NREL) publication, ‘Solar Radiation Data Manual for Buildings,’ contains just the type of solar insolation data needed for passive solar heating design calculations. This manual is out of print, but is available for free download at: https://rredc.nrel.gov/solar/pubs/bluebook/. The manual contains monthly and annual average values of total solar irradiance for 239 locations throughout the U.S. and its territories, based on data collected from 1961-1990. Data is available for cities in all 50 U.S. states, the Pacific Islands, and Puerto Rico. manual. (click on the table to see a larger version). As shown in the sample from the manual, there is data for solar insolation on a horizontal plane and on north, east, south, and west facing horizontal planes, each in Btu/ft2/day. The sample table gives monthly average values for Jan, Feb, and Mar. The NREL manual has average values for all 12 months and an average annual value. For each plane orientation, there are data for global, diffuse, and clear-day global solar insolation. The figures for ‘clear-day global’ solar insolation give the total solar irradiance on the plane (including both direct and diffuse solar radiation) for a cloudless day. The data for ‘Global’ and ‘Diffuse’ solar insolation give average actual insolation values, taking into account the average presence of clouds. windows is of primary concern for passive solar heating design. 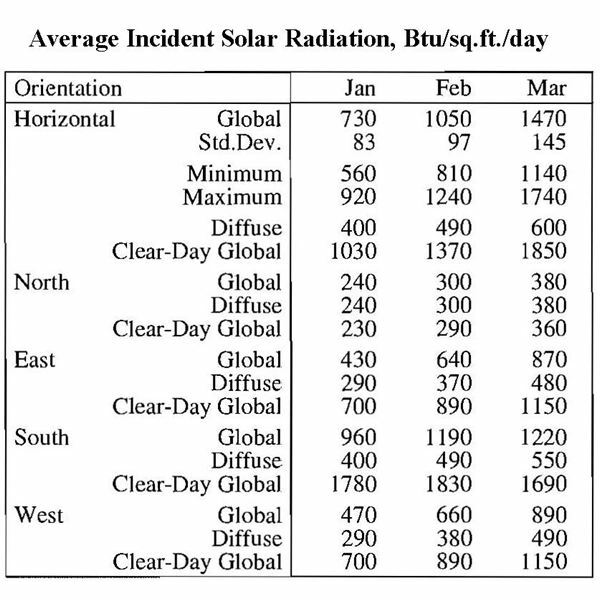 As you can see in the table, data on transmitted solar radiation is given for the same plane orientations as that in the incident solar radiation table. Data for the horizontal planes is given for ‘shaded’ and ‘unshaded’ windows. The data for shaded windows assumes roof overhang or awning shading as specified in the manual for each of the included 239 cities. That overhang shading is specified in the manual so that it shades the window during the summer, but not in the winter. The data in this table is for conventional, single-strength, clear, double glazing with 0.125 inch glass thickness. Problem Statement: Use the NREL ‘Solar Radiation Data Manual for Buildings‘ to find the average annual and average January solar insolation transmitted through a shaded, double-paned, south-facing horizontal window for Anchorage, AK, Boulder, CO, Albuquerque, NM, and Phoenix, AZ. 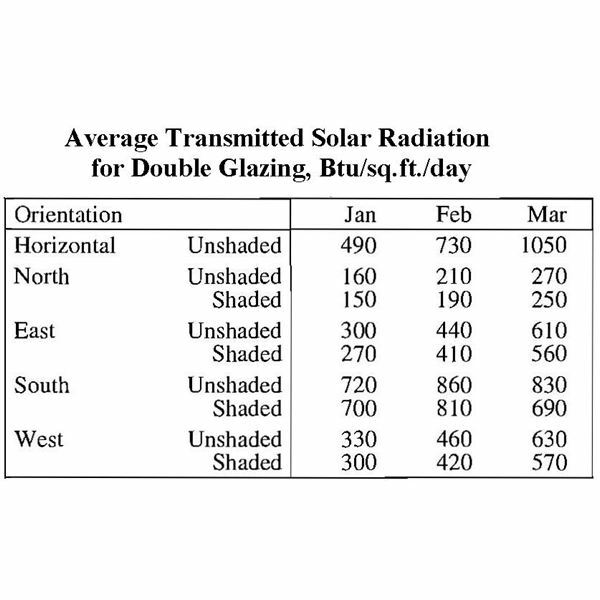 Using these values and heating degree day data for these same four locations from the article: ‘Data on Heating Degree Days for Passive Solar Heating Systems in the U.S.,’ comment on the suitability of passive solar heating for each of these four locations. Solution: The data given here can be found by clicking on the link given above for the NREL data manual and downloading it. The heating degree days data is also available in the NREL data manual and it is given in the second article of this series as noted above. As one might expect, Anchorage, AK has the least transmitted solar insolation and the greatest heating requirement. A passive solar heating system would only be able to provide a small part of the heating needs there. Phoenix has the least heating requirement of the four. Much of its heating requirement could be provided by passive solar heating. Albuquerque has more transmitted solar insolation than Phoenix, but has significantly more heating needed. Boulder has somewhat more heating need and less transmitted solar insolation than Albuquerque. The first three articles in this series describe 1) the components and general configuration of a passive solar heating system, 2) heating degree day data as a measure of the heating needed at a given location, and 3) a procedure for estimating the rate of heat loss from an existing building using fuel or electricity use information from utility bills. The last article describes how to utilize the information in the first four articles to estimate the percentage of heating requirements that a given passive solar heating system at a given location will be able to provide. Passive solar heating systems use components of a building, building orientation, and building design to provide passive solar heat. Calculations involving heating degree days, building heat loss rate and solar insolation data can predict the performance of a passive solar heating system. Heating Degree Days for Passive Solar Heating Systems in the U.S. Solar Insolation Data for Passive Solar Heating at Your Location in the U.S.